A memoir of heartbreak, thousand-mile races, the endless Alaskan wilderness and many, many dogs from one of only a handful of women to have completed both the Yukon Quest and the Iditarod. In 2009, after a crippling divorce that left her heartbroken and directionless, Kristin decided to accept an offer to live at a friend's cabin outside of Denali National Park in Alaska for a few months. In exchange for housing, she would take care of her friend's eight sled dogs. That winter, she learned that she was tougher than she ever knew. She learned how to survive in one of the most remote places on earth and she learned she was strong enough to be alone. She fell in love twice: first with running sled dogs, and then with Andy, a gentle man who had himself moved to Alaska to heal a broken heart. Kristin and Andy married and started a sled dog kennel. 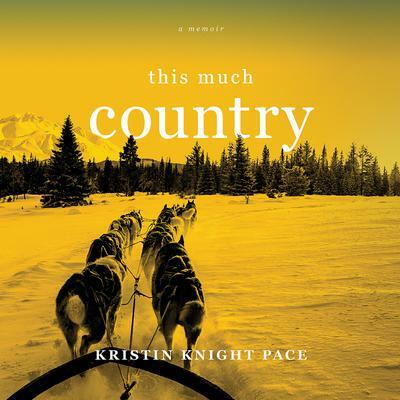 While this work was enormously satisfying, Kristin became determined to complete the Iditarod -- the 1,000-mile dogsled race from Anchorage, in south central Alaska, to Nome on the western Bering Sea coast. THIS MUCH COUNTRY is the story of renewal and transformation. It's about journeying across a wild and unpredictable landscape and finding inner peace, courage and a true home. It's about pushing boundaries and overcoming paralyzing fears.